I know you can easily buy frozen, pre-made pigs in blankets but they just won’t taste like this. They just won’t. Though this recipe requires a bit of easy assembly, it has only three ingredients. Yes, three. I have to give a shout out to Applegate’s “Greatest Little Organic Uncured Smoky Cocktail Franks” – they live up to their name – but use whatever brand you prefer. You could even go the vegetarian route; just make sure whatever you use isn’t full of nitrates or synthetic products. And make sure you buy puff pastry sheets, not rounds. If you want to get extra fancy, sprinkle some poppy or sesame seeds on the franks before baking. These were devoured by 4 people in minutes, so make several batches for a crowd. Happy snacking! 2. Unwrap the pastry dough and place on lightly floured surface. Unfold and remove any remaining packaging, then dust both sides of the pastry with flour. 3. Gently roll out pastry into a large, thin rectangle, taking care not to tear the dough. (seal any tears with a drop of water). Using a very sharp knife or pizza wheel, cut the pastry into an 8 x 5 grid to form 40 small squares. 4. Sprinkle pastry with a little more flour, then place a frank in the corner of a square and roll diagonally to enclose. Seal with a drop of water, if needed. Repeat process til all franks are used. 5. Place completed franks on a greased baking sheet, then transfer bake until puffed and golden, about 20 minutes. Let cool briefly before serving with mustard and ketchup. 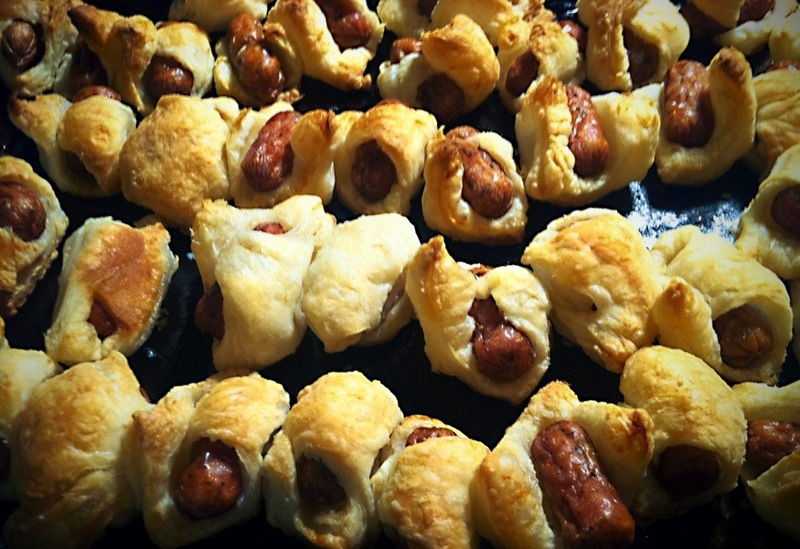 Pigs in blankets have always been one of my guilty pleasures. I even like them made from those awful crescent rolls. (Don’t tell anyone.) These look grand! Thanks, Michelle! Let me know how it goes if you make them.